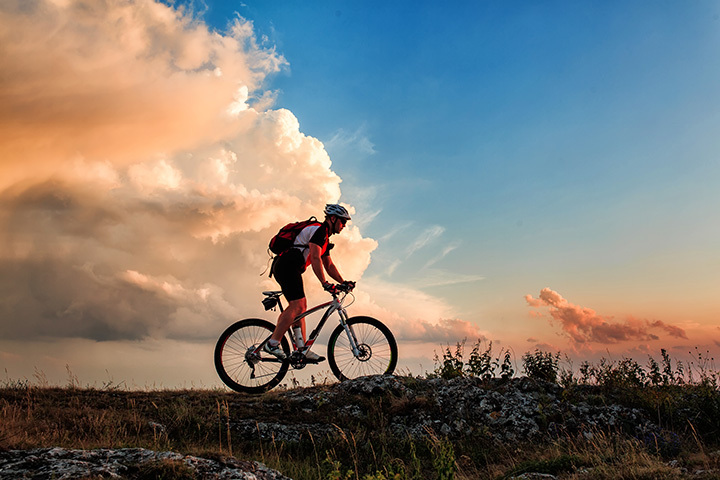 If mountain biking is not just a hobby but a way of life for you, then New Mexico is your place. You’ll work hard, get close to nature, and enjoy an afternoon of ad-venture. So pack up your bike and head out to these 10 must-ride trails in the Land of Enchantment! There are a couple of ways to ride this trail. One involves riding the entire length and then getting a shuttle ride back to the beginning. The other is an out-and-back on part of the trail. Great downhill and single track through the beautiful Carson National Forest, some technical challenges, but a true adrenalin rush. Best May to October. Spectacular beauty defines the region where this bike trail takes you. Rocky out-crops, beautiful colors and smooth single track runs through a bizarre and unique landscape. The trail, accessible year-round, is about eight miles long and con-sidered difficult. The experience is amazing fall, winter and spring. Summer is hot! This is one of the premier mountain biking resorts in the world, the largest in the Rocky Mountains and voted “Best in the Southwest” by MTB Parks. With 60 miles of terrain, accessed by the ski lifts, you’ll find great drops, technical challenges, rolling single track with awesome jumps and some easy, cruising areas. There’s a little something for everyone. It’s a mountain biker’s dream ride. Be prepared to get your feet a little wet on this trail that crisscrosses Tesuque Creek. It’s about 10 miles of downhill, single track, switchbacks, climbs, boulders and jumps through dense pines trees, stands of aspens and lovely meadows. The ride begins at 10,300 feet and drops 3,400 feet so if you do an out-and-back it’s a grind. There are a few technical sections, but not enough to deter any rider comfortable on a bike. All points on this maze of trails loop together and lead back to the main trail, like a giant bowl of spaghetti—thus the name. The trails vary in length and difficulty, making this a great location for riders of all skill levels. It’s close enough to town that you’d have to work at getting lost. Beautiful single track through pines and aspens at about 6,500 feet. For the daredevil, there are a few berms and jumps at the end of the trail. There are three loops to this system that take a rider across the spectacular vistas of First, Second and Third Mesa on the Hopi Reservation just outside of town. The terrain is challenging and technical in spots with narrow single track, packed clay and some slick rock and sand areas interspersed. The trail from one mesa to the next gets increasingly more difficult with additional short climbs and steep downhills. Maps and signs are posted at all intersections and the trails are well-marked. If you’re looking for wide-open spaces, then look no farther. There are 19,000 acres of desert terrain to roll through, most of which is open to mountain bikers. Close to 42 miles of marked trails cross sandy arroyos and slick rock. There’s not a lot of shade, so take plenty of water. The same trails are open for motorized use, too, so be on the lookout for other riders. The entire trail system is about 27 miles with a good amount of challenging climbing, rocky single track, easy double tracks, fast downhills and wide-open fire service roads. At various points, you can jump off the trail and head down one of the service roads and get back to your starting point, if you’re looking to shorten the ride. The trails traverse beautiful forests and take you to awe-inspiring vista points. The best time to ride this trail is in late May or early June, before the heat kicks in. It’s five miles of fairly moderate single track riding in a remote area across rugged terrain. There are technical spots that make this a ride for the more experienced. Challenging sand and gravel areas make the going more difficult than easy. Be prepared to dismount regularly. Take plenty of water. This trail is just fun. With a few twists and turns to make things interesting and a lively downhill, this is a favorite for all skill levels. As you climb out of town, you’ll go through quiet forests, broad meadows and crisscross a stream a couple of times. The single track is user-friendly and easy to navigate. A little steep at the top, but well worth the effort. What goes up must come down!